When it comes to gaining a political edge over opponents, some politicians have no problem resorting to underhanded and downright shameful tactics. Such is the case with Indian Prime Minister Narendra Modi, who, it was just revealed, recently changed his Twitter account to look exactly like Ron Perlman’s in a shameful bid to get more Hellboy fans following him. Modi was particularly effective when he took aim at political rivals. Yikes. This type of behavior is totally unbecoming of a world leader. 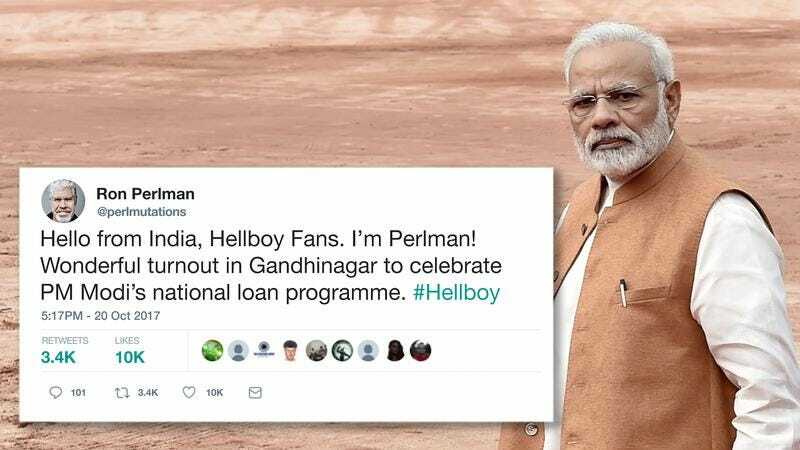 Prime Minister Modi has since deleted the deceptive tweets and stopped trying to impersonate Ron Perlman on Twitter, but if he hadn’t been caught, who knows how long he would have kept manipulating the passionate Hellboy fanbase to gain votes and political influence. Hopefully, with the help of vigilant watchdog organizations, this will be the last time that a world leader impersonates Ron Perlman for political gain.